Meet our new guest artists from Derbyshire Artists' Guild at their exhibition launch on Friday 26th. Enjoy a breath of Shetland air from singer, songwriter, guitarist and fiddler, Barry Nisbet on Saturday 27th and for anyone who loves to draw, there's Gallery Interactive on Monday 29th April. ​Take a look at all of our events here. This year we'll be hosting over 60 performances including theatre, music, comedy and storytelling at the 40th Buxton Fringe in June. Full details coming very soon. Tickets will be available from May 1st. Sunday - 11.30am to 4.30pm. The Green Man is an independent contemporary gallery and arts centre in Buxton, Derbyshire, managed and run by its artist members. It is a not-for-profit organisation and all of its staff are volunteers. The gallery has been open since November 2012 and its current home is Hardwick Hall, a fascinating Victorian building in the centre of town. In the past five years The Green Man has established itself as an exciting creative hub for the local community and visitors alike with a varied programme of exhibitions, workshops, classes and performances. There are extensive and ever-changing exhibitions of original contemporary art and craft by gallery members, and by guest artists and designer makers from across Derbyshire. These include paintings, photography, prints, mixed-media, textiles, jewellery, ceramics, aromatics, hand-carved wooden items and a wide range of original artist cards and postcards. Upstairs there is a large Workshop Room which is available for hire and the ground floor gallery can also be hired as a performance venue and for meetings, talks, presentations and receptions. Entry is free and the welcome is friendly and warm. 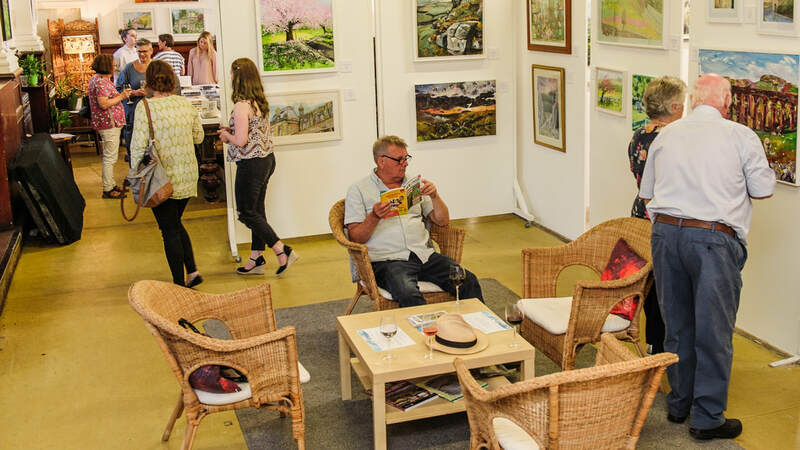 You can stay for as long as you like to browse and buy or relax with a coffee and chat to the artists on duty. Shetland musician, Barry Nisbet, coming to The Green Man on 27th April.